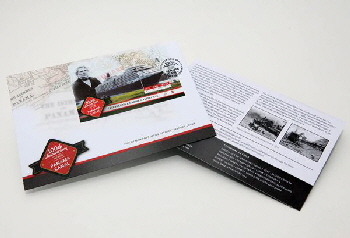 The Isle of Man Post Office Panama Canal Commemorative stamp issue may be viewed directly on their store site here (the link may not function after stocks are exhausted). Unfortunately the original stamp first day cover was issued with text prepared by an independent researcher which had a large number of factual inaccuracies in it concerning William Kennish. Corrections were provided from the author of this web site which were understood to have been incorporated into the 2014 Stamps Year Book, but were not corrected for the cover issue. The correct text can be viewed below or downloaded from this link as a PDF file which is correctly formatted to be cut and folded to duplicate the first-day cover layout. The project commenced following a number of surveys of Panama and New Grenada (now called Columbia) which in 1850 had been uncharted territory. Thanks to Manxman William Kennish’s nine transits of the peninsula area, the best routes with and without locks were established. A native of Cornaa, Isle of Man and born in 1799 he joined the Royal Navy at the age of 22 and was recognised by the Society of Arts Manufacture and Commerce, and is remembered as a notable engineer, explorer, inventor and poet. In 1855 he was employed by the US Government to accompany a joint Army and Navy survey of his lock-free southern Atrato-Truando canal route. Sadly he died in New York City in 1862 before the final canal location was selected. William Kennish was, in his own words, 'Manninagh Dooie' - a true Manxman. Born in Cornaa, Isle of Man in 1799, his father was a small land farmer and Kennish spent his youth working on the farm whilst before learning the trade of ship’s carpentry in Douglas. Aged 22 he entered the Royal Navy speaking little English and unable to read or write. Within seven years he was promoted to master-carpenter of the British fleet in the Mediterranean, a testament to his technical knowledge and natural abilities. In 1829 whilst on board HMS Hussar he invented 'a method for concentrating the fire of a broadside for a ship of war,' for which he received the Isis gold medal award of the Society of Arts and Commerce. He returned to the Isle of Man in 1844 and settled in Ballasalla where he became headmaster of Ballasalla Parochial School before he emigrated to America in 1849. His surveys of potential inter-oceanic canal routes in southern Panama and New Grenada were acknowledged by Baron Von Humboldt and his work culminated in 1855 with the US Government conducting a $25,000 expedition to verify his final survey. Kennish continued as an engineer and inventor up to his death in New York City on 19th March 1862.